Here is a list of wedding venues which are available on the island of Menorca. Over the years we have gained a good breadth of knowledge for many beautiful wedding venues. Here are a few which should help you in choosing a venue for your wedding day on the most easterly Balearic island of Menorca. Iglesia Santa Margarita is a small church in Es Castell. The services are delivered by Reverend Paul Strudwick who arrived on the island around Five years ago. It is an Anglican Church and so if you are C of E and you are wanting a religious ceremony, we would strongly advise that you get in touch with the church. Reverend Strudwick has a very good relationship with many of the venues. He has delivered wedding ceremonies across the island and we have worked along side him many times. His wife also delivers non-religious ceremonies, so between them, they cover all bases. What we have started to see over the last few seasons when photographing the ceremonies on Menorca, Catholic churches are beginning to open their doors to non-Catholic couples. Reverend Paul Strudwick can let you know the churches which allow this. In addition to local venue knowledge, he can advise on what you must do in England before embarking on planning a destination wedding on the Balearics. In previous seasons we have photographed non Catholic weddings in the sanctuary at Monte Toro and a small church in Ciutadella. It is therefore possible, with permission, to access these places with the right connections. If you do decide to have a religious ceremony, Reverend Paul delivers wedding ceremonies with passion, humour and dedication for the couple. You’ll instantly warm to this man. And although the ceremonies will have a religious undertone, it will also be delivered with reference to the island you’re on and have individuality for you as a couple. Full of personal touches, the service will be a memorable one. Sant Joan de Binissaida is near the village of Binissaida which is on the east of the island near Mahon and Es Castell. It is a boutique style hotel with varying styles of bedroom and unique public spaces which has been converted from a farmhouse into the splendid hotel which is now very popular for weddings. The popularity has grown so much over the last few seasons that the owners have built an area specifically for hosting weddings. A covered space with its own lawned area, toilets and kitchen from where the most delicious food is served up. The chef is the owner of several restaurants in Mahon, one being Ses Forquillas near the esplananda in the main town of Mahon. Ask for a taster menu for your planned wedding here and you’ll get superb quality which will not disappoint. The presentation is also something else which helps us when it comes to photographing it on the day. The hotel is set within the beautiful countryside, a rural setting which is very close to the sea. The penthouse bedroom with it’s own balcony has views of La Mola on the other side of the port of Mahon and the Mediterranean. A worthwhile addition to any bridal preparations. An enjoyable vista to enjoy a glass of fizz before you head down to the ceremony. The hotel has extensive lawned area, a pool and bedrooms which will accommodate most of your family and close friends. Bedrooms are limited though so if it is a large wedding party then transport will have to be factored into your budget. Hotel Alcaufar Vell is on the right hand side shortly after leaving the roundabout at Sant Lluis, heading down to Alcaufar Vell. It has a rustic feel. A converted farmhouse with charm and character. There’s no mistaking that you are in Menorca when you sit in the orchard garden at the rear of the hotel. Sublimely quiet apart from the occasional noises from the animals. Dry stone walls stretching into the distance in rural Menorca. To have your wedding ceremony here under the shade of the tree canopy is a privilege you will never forget. The hotel has a large area under canvas to host the very largest of wedding parties but you may have to book the hotel exclusively. If other guests are booked in then wedding receptions may not be allowed so try and book the hotel as soon as you know your dates. The vineyard of Binifadet is just a short distance from Sant Lluis on the road to Es Castell. The popularity of weddings on the island has given the owners of the venue good reason to extend the facilities to specifically target anyone wishing to get married on the island. The new area is an extension to the existing visitors centre which has the cafe, processing vats and storage area for the barrels. The new area now has a bar and al fresco dining area with new kitchen where wedding guests can relax before or after the ceremony. 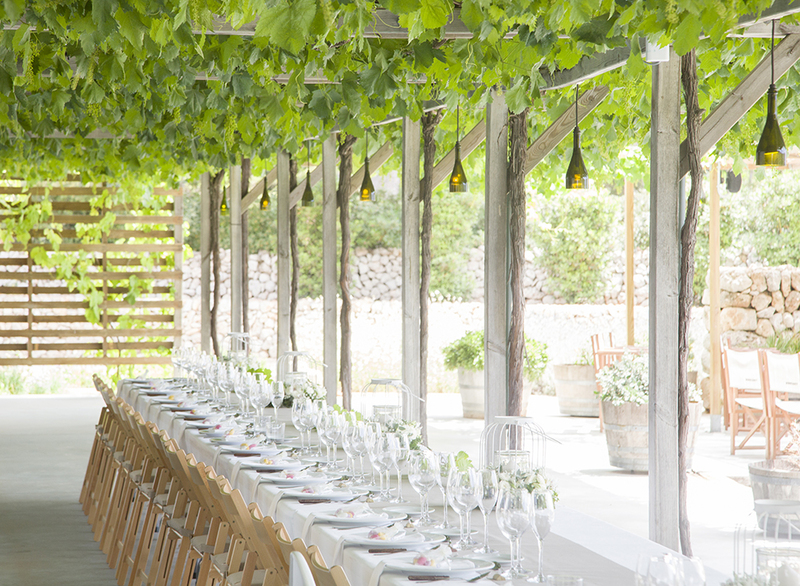 The ceremony is delivered on the other side of the building under a covered canopy of vines just beyond the photograph displayed here. The catering and professional staff are what you’d expect of a place which is immaculately presented, modern and tasteful. A superb venue which should definitely be on your list of places to visit if you’re planning your wedding on the island of Menorca. Santa Barbara sits in acres of private manicured land near the small town of Sant Climent. If you want to put an individual touch to your wedding, which hotels cannot quite manage, then look at private villa hire. It is usually more expensive as everything has to be brought in, but the extra effort can be well worth it. We were photographing at this wedding venue over a two day period as the bride and groom had hired the villa the day after the wedding day. The pool area serves everyone well for a bbq or paella chill out day. The gardens are the best we have seen across the Balearics. Mature trees, well manicured grass areas, several bar areas, a dance area and a flat area for the wedding breakfast. You would probably need to book an appointment to view Santa Barbara as it is a private residence and occupied. Please write to us with a request and we will put you in touch with the relevant person on the island. Isabella Beach Club can be found in Playa de Fornells. It sits atop the cliffs by the sea and the landscape beyond the shore is some of the most dramatic on the island. The venue is impressive and wouldn’t look out of place in the hippest parts of Ibiza. Everything is white or tonal shades of grey with the odd splash of colour. We have photographed weddings here on a couple of occasions and it makes for a great photographic backdrop. Add it as one of the best newcomers to the island. It is already becoming very popular so make sure you add it to your list of places to visit and then get it booked if you’re suitably impressed with everything they do here.